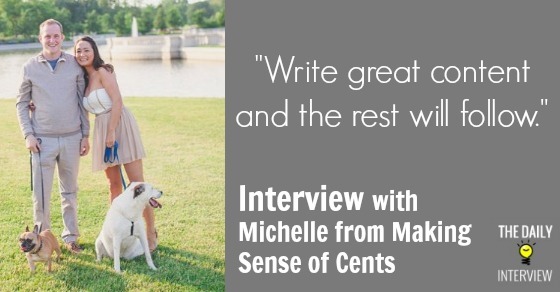 Michelle from Making Sense of Cents is the perfect example of how hard work and persistence really pay off. Up until October 2013, her online work was all a “side business” to her full-time job, but her success allowed her to take the plunge into complete self-employment. In 2013, while mostly working a full-time job, she managed to still earn over $100,000 with her side business. She makes money from a variety of sources, including her own personal finance blog. She also manages websites for several clients. All in all, it’s a great story about how creating your own successful business is very possible if you take the time to build it up while working a “normal” job. From there, it’s all about working hard, being yourself, and not giving up. 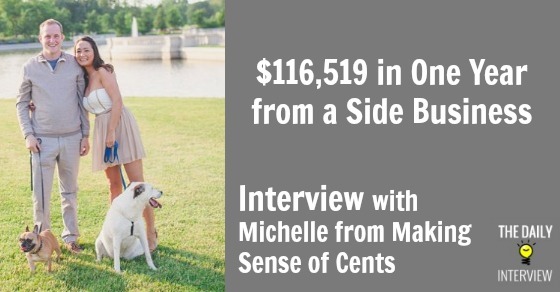 Michelle, I’m a big fan of Making Sense of Cents – I love all the personal finance advice as well as how transparent you’ve been with your monthly income reports. Tell us a little bit about yourself and your journey – how did you get into blogging? What are the other areas of your business that contribute to your monthly earnings? Just a few years ago, I never even thought twice about blogging. I didn’t really know anything about it, and I didn’t know anyone who did it. I also didn’t know a single thing about personal finance bloggers – I didn’t know there was such a large community! One day, I was reading a magazine, and in it they talked about the website Daily Worth. I then became addicted to reading their personal finance articles, and I started perusing the many comments on their articles. I then came across several personal finance bloggers and started reading all of their websites like crazy as well. Then before you know it, I started my own personal finance website. I didn’t start my own personal finance blog for any specific reason. I just thought I had a story to share, and I really like to talk. I started out with my blog as a semi-anonymous blogger, but I am now fully public. Anyway, back to the beginning. I was reading a lot of blogs that talk about their online income (such as Budgeting in the Fun Stuff, Newlyweds on a Budget, and Smart Passive Income) and I wanted to try to make money online because it sounded a lot better than the day job I had. I didn’t know anything about making money online, and I thought there were just a few lucky ones out there. I figured I had extra time though so I might as well just put myself out there and try. I also wanted to work on my side business because I had $40,000 in student loans (don’t worry, those are all gone now – read more about my plan to pay off student loans quickly) and I didn’t want those hanging over my head when I finally made the switch to self-employment. My monthly earnings are a combination of many different things. I like to be as diversified in the online freelancing world as I can, since I know that online income is not extremely stable. Some of my many areas include: managing my numerous websites, managing websites for others, social media management, staff writing, and more. I talk a lot about my many ways of making money online here. I think that my biggest success is that I was able to grow my business enough in 2013 in order for me to switch to full-time freelancing. In 2013, I managed to make $116,519 with my side business after most expenses but before taxes. I was able to have a successful year while also keeping my day job up until October of 2013. I also had a year full of fun and exciting trips (being location independent is great! ), so I think 2013 was my best year yet. My business is now my full-time business, and I haven’t looked back once. Yes, my income significantly increased in that time period. There are many things that attributed to this fast growth in 2013. The main thing is that I really focused on my business and worked on it full-time because I knew that I wanted to switch to full-time freelancing, whereas before I wasn’t spending nearly as much time on it. I added services and websites to my portfolio as well. Before January of 2013, I believe I only had one website, whereas by December of 2013 I had around six, along with many other websites that I helped manage for many others. Although you’ve encountered some great success, I’m sure everything wasn’t always running so smoothly. What do you consider to be your biggest failure, and what did you learn from it? My biggest failure was definitely staying on Blogger too long. I started my blog on there, mainly because it was easy to use and it was free. Blogging on Blogger didn’t require anything from me, and I thought that was great because it started out entirely as a hobby. It was a failure because having your website on Blogger means that you do not own it. They can delete it at any time and that was really scary to think about. Also, being on Blogger meant that many people did not take me seriously. Once I switched to self-hosted WordPress, it was like my whole life changed. My income grew significantly and my blog started to grow more. For someone who is just starting out creating a blog, what advice would you offer with respect to building an audience? What were the primary ways that you built your audience initially? If someone is new to blogging, I have plenty of advice for them! My advice includes: being yourself (no one likes a fake person, and even though it’s online, people can tell), having an easy to navigate website, providing high quality content, and networking like crazy. You can have the best content out there, but if you are not networking, then it would be hard for anyone to find your website. The primary way that I built my audience was by networking. Luckily, I enjoy social media and reading blogs a good amount, so this was one of the best parts about blogging. Different ways to network include tweeting others, engaging with readers on Facebook, leaving thoughtful comments on other blogger’s website, guest posting, and more. Let’s take a step back and look more generally at blogging for a living. If you had to take your best advice and put it into one sentence or phrase, what would that be? You can find me at Making Sense of Cents or tweeting my random thoughts all day on Twitter. Thanks for sharing your story with us, Michelle! Do you have any questions or comments for Michelle? Leave them below! Michelle is awesome. Definitely an inspiration for me to grow my business and add on more sites to my portfolio. While I don’t have as much time to dedicate to the business, I am happy with what it has given me. Thanks for commenting, Grayson. I agree – she is pretty awesome!